It is certainly an understatement to say that the ideological frame of thought of most societies, which by the way, includes the mainstream church membership perceptive value of existence has drastically dropped. Either we look at it from a sociocultural economic perspective, to the broader corporate governance and leadership policy, to the use of religion to dull and hypnotize the subconscious mind of the people. The alarming thing here is that this life altering changes will continue to systematically overwrite the original code system of human thought process. At list, this is the plan set in place by the forces of darkness through their positional principalities over communities, cities, regions and nations. There are sleeping ancient powerful evil systems, awakened and positioned within various sphere of society today, whose core mission is to alter, challenge, override and corrupt the eternal prescribed order and principle of precise human existence. We know that these forces have infiltrate every aspect of life, and only those who are truly discerning and are equally prepared for this unseen mental ideological war can stand in victory at the end. If you have not been taken to the river of the Spirit of truth for the washing of your sight, and shift from the sensual cosmetic concept of what is defined as ‘life or freedom’ today, am afraid you may not escape the strategy of defilement lurking around the soul of our community and cities today. The gods of this age has intensified their efforts to keep the minds of men and women blind and dull from knowing and accepting the truth. The battle for truth is more real than any war taking place today in the war turn regions of the earth. Very few in the body of Christ today are actually aware or conscious of what is happening in the world or within their own lives, with regards to the rise of a host of powerful evil force of darkness, using the current democratic humanistic system set in place to desensitized and demoralized millions of human minds. We as the body of Christ are being called to wake up from our deep spiritual slumber into a new day of active participation of the deliverance and redemption of the soul of our family and community in this season of increased activity of darkness. As the kingdom of the lord presses us further into a season of preparation in engaging the battle of the last days, we are also seeing increased illuminating light and insight been released from the throne of grace on this matter, as it relates to the needed arsenals required to engage and vanquish the forces of darkness waging war within the thought realm of members of the body of Christ. Like I said earlier, there is a subtle ongoing war against all followers of our lord Jesus Christ that is more visible than any battle being fought against the worst extreme religious terrorist of our time. In fact, winning the battle against all forms of darkness and terrorism alike, will be undoubtedly determined to the degree we are able to identify and win this unseen but yet so real a battle. I am referring to the battle taking place within the frame of thought of all humans. Winning the battle over your mind is not just another fine and trending message the 21st century church needs to hear and then shelve it to the archives of its revelational knowledge which is what we do best. We are seeing a growing trend in church today where people are becoming more addictive to hearing so called new revelation from the super apostles and prophets that caries little or no power to challenge and reform the rigid inner structure of the perverted state of thought. The future of the church, and every single human on this planet is determined on how serious we take this message, and of cause, apply its undiluted truth to every facet of our daily life existence. There is virtually little or nothing we can do even as spiritually informed people without dethroning the soul from its current illegitimate position of authority and influence. The soul of man was not designed to rule, and God the father has not changed his mind regarding his original functional order of governance. The human Soul was created to express the life of God active within the human spirit. Man is a spirit, created with a soul to relate and express love and affection which is God’s primary nature. Love, as prescribed from biblical view cannot be expressed without the functional capability of a well reformed, transformed and restored emotion. The soul houses all the faculties that allows man to live and behave as his creator. It bothers me that today’s church can boast regarding the acquisition of some grand spiritual revelational knowledge, yet, very little seem to be known with regards to the core principles that both shaped and altered the inner reality of human behavioral character personality. While a lot of strides has been made from the outer reality of our salvational experience, yet, the journey into the inner life of spiritual experience can only become effective when the soul is subdue and restored back to its original place under the influence of the spirit man. The days we are entering are days where the rules of engagement in spiritual battles are fast changing, and we need to arm ourselves with a fresh ascended revelation that enhances and fast-track our ability to identify and be able cast down false imaginations and thoughts that has taken our minds and that of our community captive from reaching the height of its divine objective in creation. When the view or perception we embody varies from consistent balanced spiritual footing, we have for a certain, directly or indirectly exposed the doorway of our minds to be influence by forces of darkness, and its modern day idolatry worship, expressed under the guise of democratic New Age Liberty. Redefining the concept of biblical spiritual warfare. The mind is in no doubt one of the most powerful human faculties, designed within the soul realm by Jehovah himself to help man create, discern and make wise decision on various life’s complex issues and challenges. The mind is certainly a creative living force that if properly nurtured and channeled on the right biblical pathway, will not only accelerate our faith possibilities, but can also enhance redemption, development and ultimate restoration of all creation. 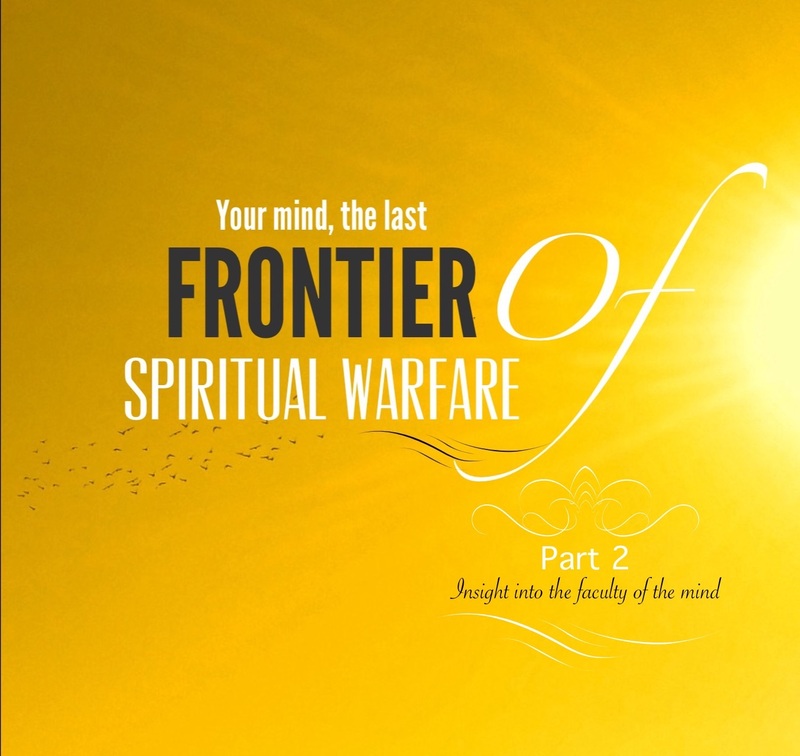 However, if the mind is neglected, indiscipline, untamed and spiritually malnourished of its required biblical truth, by default of its corrupt fallen nature, it carries enormous influence and capacity to impose its own rebellious agenda on you in a very subtle and unrecognizable manner that can cause you a huge spiritual setback. It is certainly true that whatever you drop within the soil of your mind will germinate, grow and produce its fruit in a multiple fold, it’s only a question of time. Influence into the thought realm. As we continue with this study I would like us to explore some fundamental spiritual values that could greatly improve our spiritual development mostly in this era of the third day reformation of the church and creation. The epic battle of the Age is focused on the regaining, the reforming, and ultimately, the restoration of the lost faculties of man back to the divine order and influence of Christ authority and dominion. Whatever kind of war we have seen manifest either from spiritual or natural realm, all passes through the portal of the human mind. Ideologies, good or evil, are shaped by the thoughts that filters into the mind. There is enough evidence in this current season that proves that Satan and his cohorts are intensifying their mandate activity through the systemic work of deception, ignorance and seductive luring to gain full control over the thought, emotion and imaginative realm of all humans especially those in key areas of leadership both from domestic life, educational communities, and of cause, corporate governing institutions. Toddlers and teenagers are not left out from the assault of this satanic attack. From the songs they are expose to, to the video games they play, to the cartoons and programs they watch, are all strategically designed to lure, dull and capture the innocent minds of our children. The mission to capture and lock the soul in a state of carnal humanistic pattern of reasoning is very rife in this season. Think of this for a moment, the history of your entire life, that of your family and the larger society are all predicated on the kind of thought pattern that both informed and shape the decisions that defines the present condition of life. Decisions are made based on our exposure of a particular knowledge or information at our disposal, which ultimately determine or shape our frame of thinking. The current sociocultural realities, the battle of media propaganda, so-called technological ground breaking ideas, to the extremism of civil wars, religious terrorism, regional destabilization, systemic regional or community marginalization, sociocultural imbalances, racism, xenophobia, poverty and other forms of complex economic challenges; the policy of accepted perverse behavioral lifestyle in the 21st century society, and of cause, the promotion of corrupt leadership both from within the church community and the state to mention a few, are all defined by the ideological frame of thought which determines how society perceive, belief and ultimately decide regarding life. Thoughts are the gateway into the human soul, we therefore need to be highly discerning in regards to how thoughts gets to be formed within our soul to the point of becoming a powerful tool in shaping our perception either for development or for destruction. The state of our thought and imagination plays a huge role in the overall make up of our destiny. Whatever has become tangible and visible to the human eyes has first been conceived and birth through a certain frame of thought. The mind is the ground of conception either good or evil. The unregenerated mind is the portal to all forms of negativity. Meaning, how we choose to live in attitude and character is predicated upon the type of thoughts we are exposed to. The salvation of our mental faculty is crucial to our spiritual breakthrough and advancement. Where we are today and what we are going to become in the future will be shaped and highly influenced by the condition of our frame of thought. There is no doubt that even the best of wisdom and knowledge to a large extent are influence by the state of thought. If we are struggling with an unhealthy and unbalanced frame of thought, little or nothing can be achieved in terms of maximizing our spirituality and its related creative and productive capabilities. The subjection of the unregenerated human thought pattern and the process of the transformed mind has been a fascinating subject to me. Ever since I discovered that one’s initial confession of Christ as his savior does not automatically overwrite the whole issue of the corrupt and degenerated state of the soul’s faculty. Old imbibed habits, attitude and ideological beliefs locked within the soul realm, still to a very large degree, influence the view and decisions made even after the acceptance of the Lord. While the new life received at the foot of the cross did reawakened the dead human spirit, the process of the transformation and restoration of the sensory and emotional faculties of man through the power of the word however needs to kick starts the required change within the mind, so that there can be a synchronized lifestyle into one new man, reflecting the life and character nature of Christ in its fullness. A positive change in human character is hugely determined on the reformation and transformation of the thought and perception of man. Real lasting change is initiated through the inner working of the spirit of salvation within man’s faculty. This salvation, further proceeds to the seat of the soul, the realm of self-awareness and behavior. The soul houses sensory cognitive navel system and other human behavioral science, which ultimately defines emotion, feelings, thoughts imagination, attitudes, ideas and desire, intellects, creativity and other human actions. Traditions, Beliefs, and other human cultural identities are all parts of what is formed within the frame of the human soul. This is basically the realm where fallen human identity and personality are formed or shaped. Indeed, the salvation of the spirit-man kickstarts the process of the rebirth of the self-centered inherent nature of the soul until the entire faculties of the soul life becomes consumed in the light and glory of Christ image, already in existence within the spirit-man. As simple as this truth may sound, it however remains one of the most difficult principle for many in the Body of Christ to understand, accept and practice. There is absolutely no way the culture and life of the kingdom of God can fully manifest through a mindset that is easily influence by the ideas and suggestions of humanistic and satanic ideological beliefs. This has been an ancient battle that has almost destroyed the human race, and of cause, weaken the the church from exhibiting her governmental authority. The enemy has strategically establish a foreign rebellious way of thinking to the first man and his wife when he suggested that eating the forbidden fruit will open their eyes and they will be like God. I felt it is important we clearly understand the whole concept of spiritual battle from a precise and broad biblical definition so we don’t find ourselves like the person who is beating the air according to Paul’s description in 1 Cor 9:26. This is a topic many have spoken and written about with great insight. However, I strongly believe the Lord is shedding more light and broadening the spiritual insight of the church as it relates to the current position of the church in the place of kingdom advance. The light of divine truth is fast moving from the outer reality she has camped for a long period. The second day journey of truth demands we understand the present phases of the Spirit in terms of the progression of our salvation into the preferred place in God. The salvation of the soul paves the way for man’s total reformation. It is at this point the nature and image of the last Adam becomes fully manifest in and through man. Both the life and the mind of Christ flows through this regenerated spirit, soul and body. Every aspect of the sleeping man from the fall in the garden is completely awakened through the power and glory of Christ. The nature of the mind we are made of plays an important role in shaping and determining the kind of life and future we are going to experience both from a personal level to a more corporate global reality. The fact that it is an open declaration in the word of God that the regenerated Mind is the (temple) habitation of God makes it even more challenging for every true follower of our Lord Jesus Christ to maintain a quality life of thinking that does not give in to challenge and assault of the enemy who is bent on corrupting the thought process and imagination of all men. The enemy’s chief mission is to make sure that believers don’t live up to the standard value set in God’s word. We shall further look into the scheme of the enemy as it relates to the condition of human thought pattern. Suffice to say, by divine construct, man is designed in three corporal departments, which are his spirit, soul and body. Two of these parts cannot be seen with the carnal eyes, while the last, which is man’s biological part gives covering and expression to the rest. Our lord Jesus Christ gave an insightful example to differentiate the function of man’s tripartite reality according to mark7:15. What goes into a man, meaning, that which enters through the stomach as in relating to food is not what defiles a man. He went further to explain also that what comes out of the man, meaning from his spirit or soul is what makes him on clean. Man’s defilement is based on the state or condition of his frame of mind which is housed by his soul. The soul houses all the psychological and emotional realities of a man’s world. We shall further examine this highly important principle. Let us however understand this basic but highly critical protocol of human regeneration. The spirit, at the point of salvation is reawakened from spiritual death while the soul remains unsaved but can be influence to follow the direction and leadership of the regenerated spirit if its properly built and disciplined . This however, is not be possible until the spirit man is energized with the life and light of Gods truth until it regains full authority and dominion over the total man. This is what Paul was trying to communicate to the Church in Rome, according to Romans chapter 12:1-3. The faculty of the three personality of man are patterned to function in harmony so their victory can be assured against the assault of darkness.